The human eye is an amazing instrument. It is the body's camera, capturing images of the world with striking clarity in a virtual instant. The eye and the typical camera share many of the same structural features. A camera needs an operator, a housing (box) to hold onto and to contain the working parts and film, an aperture to let the light in (preferably one that allows for different light conditions), a lens for focusing the image, and film for capturing the image. Then the film must be developed (or the digital images downloaded). The following description illustrates how the eye performs these same functions. The eye consists mainly of three layers, or tunics. The bulk of the outermost layer (fibrous tunic) is the white of the eye, or sclera. Like a camera's housing, the sclera is the eye's skeleton, giving structure to the eye and protecting the internal components; it also provides an attachment site for the eye muscles that position the eye under the control of the brain. In the very front of the eye, where the light must pass through, the fibrous tunic is a transparent structure called the cornea. The cornea is responsible for approximately 70 percent of the focusing power of the eye; without a cornea, vision would be impossible. (One can, however, see without a lens, just not very keenly.) Because it must be transparent, there are no blood vessels in the cornea. The tissue must get all of its oxygen and nutrients by diffusion; the cornea actually "breathes" across its surface (hence "gas-permeable" contact lenses can be worn for longer periods than "hard contacts"). The middle layer (vascular tunic) mostly provides for internal maintenance functions, as well as for aperture and fine focusing control. In the posterior two-thirds, the vascular tunic consists of the choroid, a layer of nutritive and supporting tissue. Toward the front, it forms the ciliary body and the iris. The ciliary body contains the smooth muscles that pull on suspensory ligaments attached to the lens, changing its shape and thus adjusting its focusing power. (Sometimes the proteins that make up the lens become cloudy, a condition called a cataract.) The ciliary body also secretes aqueous humor, the watery fluid that fills the space between the cornea and lens (anterior cavity). This fluid provides a sort of circulatory system for the front of the eye. When excess fluid accumulation causes excess intraocular pressure, the vision-threatening condition known as glaucoma occurs. The iris, the colored portion of the eye surrounding the dark opening (pupil), sits in front of the lens. The iris is made of two sets of smooth muscle that contract to produce pupil dilation or constriction; this brainstem reflex controls the intensity of the light reaching the innermost sensory layer, the retina. 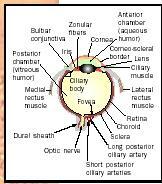 Structure of the human eye. layer instead of pigment, called the tapetum lucidum, which increases their sensitivity to low light and makes their eyes "shine" when a bright light strikes them.) When light strikes a rod or cone cell, it passes the signal to a bipolar cell, which passes it on to the ganglion cells, which perform the first level of information processing. The axons of the ganglion cells also form the "cables" that make up the optic nerve, carrying visual information to the brain. (There are no rods and cones where the optic nerve leaves the eye; this is called the "blind spot.") The retina is pressed flat against the inner wall of the eye by a thick, gel-like substance called vitreous humor, which fills the space behind the lens (posterior cavity). There are accessory structures associated with the eye. The eye is protected by being located in the orbit of the skull. Eyelashes help prevent foreign matter from reaching the sensitive surface. The eyelids help protect the exposed anterior part of the eye. The eyelids have glands that produce lubricating secretions . Infection of the glands at the base of the eyelash produces a painful localized swelling called a sty. A thin membrane called the conjunctiva lines the inside of both eyelids and covers the exposed eye surface (except the cornea); when this membrane gets irritated, blood vessels beneath it become dilated, resulting in a condition called conjunctivitis ("pinkeye"). Tear (lacrimal) glands located on the upper lateral (outside) region of the eye provide secretions (tears) that lubricate the surface, remove debris, help prevent bacterial infection, and deliver oxygen and nutrients to the conjunctiva; blinking of the eyelids provides a wiping action across the surface that keeps the eye "polished" and distributes the tears. These tears then drain into the tear ducts in the lower inner corner of the eye, draining into the nasal cavity. Another gland, the lacrimal caruncle (the pinkish blob in the inner corner), produces thick secretions that sometimes accumulate during sleep (the "sand" from the "sandman"). Most vertebrate animals have eyes that are essentially the same as the human eye. Among invertebrates, there is a wide variety of eyes. Some have simple eyespots that do not form images, detecting only the presence of light. Others, like the cephalopod mollusks (octopus, squid), have a camera eye very similar to that of vertebrates. Perhaps the most unusual eye is the compound eye found in arthropods such as insects and crustaceans. These eyes actually consist of hundreds of individual eye units, called ommatidia (up to thirty thousand in dragonflies). Each ommatidium has its own lens and set of receptor and supporting cells; each forms its own tiny picture of only a small part of the visual field. The insect's brain thus receives a mosaic of hundreds of individual images that it uses to make a somewhat "grainy" composite image of the entire visual field. Eden, John. The Physician's Guide to Cataracts, Glaucoma, and Other Eye Problems. Yonkers, NY: Consumer Reports Books, 1992. Tucker, Lael. The Eye: Window to the World. Washington, DC: U.S. News Books, 1981. Ward, Brian R. The Eye and Seeing. New York: Franklin Watts, 1981. 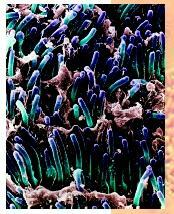 A colored scanning electron micrograph of rod cells (blue and purple) in the retina of a human eye.